By Phil Plait of www.badastronomy.com This article was written by Phil afew years ago now but is still relevant to the newest wave of "Nibiru SOHO" images to hit the web. These images show exactly what Phil describes below. What is going on in the SOHO images? A few people have been asking about this, but there hasn't been much talk about it. As it happens, I have a lot of experience with astronomical imaging. I spent about a decade working on Hubble images, and a few years before that on a ground-based telescope. I still do dabble in digital astronomical imaging. I am not bragging, just putting my credentials down to show that I am very experienced in this field. Let me say this up front: the images from SOHO are completely within the realm of what you'd expect from such images. The "anomalies" pointed out by Tuatha (who claims spaceships are all around the Sun: do a websearch on the words "suncruiser" and "SOHO" and you'll see what I mean), Ms. Lieder and the rest are not anomalies at all. They are simply things that happen when you use a digital camera. The cameras usually used in astronomical imaging are called CCDs, for Charge-Coupled Device. It's like a computer chip that's sensitive to light. The best analogy for one is like an array of buckets in the rain. Each bucket (CCD pixel) collects rain (light). The amount of rain collected depends on how much rain falls on that bucket; the amount of light in each pixel of the CCD depends on how bright an object is. When light hits a CCD it is converted to electrons, and when the image is done the electrons are "read off" the CCD and counted. The more electrons you see in a pixel, the more light hit that pixel. The numbers of electrons can be converted to images by your computer. That's how the images on, say, the SOHO site are done. Sometimes, a pixel is more sensitive to light than others. This can happen when a pixel is hit by high energy radiation like cosmic rays (which I'll abbreviate "CR"), which are subatomic particles zipping around space. What happens then is that pixel is always "bright", or "hot", even when nothing is putting light into it. You have to make a map of the hot pixels in a CCD so you can compensate for them. Ms. Lieder claims the images taken by Steve Havas show Planet X. What they really show is a hot pixel. When the pictures are properly calibrated, as several people have shown (see here and here), the "Planet X" pixel goes away. One giveaway is that stars/planets/etc. are round in the image (they cover several pixels), where hot pixels look like single points. The things pointed out by Ms. Lieder and others are single points, so they cannot be real. This shows two things: 1) you have to be careful and understand CCDs when you look at the data, and 2) Ms. Lieder is wrong. A lot of the stuff pointed out by Tuatha in the SOHO images is really just hot pixels. They aren't spaceships at all, they are simply pixels inside the SOHO camera that are a bit too overenthusiastic. When cosmic rays hit a CCD, they dump their energy into a pixel, making it look very bright. Sometime, if the impact angle is low, the CR leaves a streak. At the end of the streak, it can suddenly dump lots of energy into the pixels, making what looks like a spray. I saw this all the time in my Hubble images. Unless there are billions of spaceships out there leaving little trails in all those random images, I would prefer to assume they are actually the somewhat more common cosmic ray. In the SOHO images, there are lots of CRs. Sometimes these are particles from the Sun, accelerated during a coronal mass ejection. Matter of fact, after you see a big ejection from the Sun, the particles can hit the SOHO detectors, making it look like they were hit by a shotgun. A few of what Tuatha claims are spaceships near the Sun are CR sprays. Tuatha's claims are wrong. Remember the bucket analogy? What happens when a bucket fills up to the brim with water? It overflows. The same thing happens in CCDs. A pixel can only hold so many electrons before it overflows. Because of the way the pixels are made, the overflow goes into the adjoining pixels horizontally, so the overflowing pixel leaks electrons into the pixels to its left and right (or above and below it). If enough light is hitting the one pixel, it can overflow the adjacent pixels, which flow into the next ones, and so on. When you look at the resulting image, a bright object appears to have a bright horizontal line going through it. This is called "blooming". A bright star may bloom over several vertical pixels, so you get many rows of blooming. There is a picture posted at http://www.cyberspaceorbit.com/indexback46.html which is called the "Ra" image because there is a feature that looks like the symbol for the Egyptian god Ra. This is a perfect example of a bright object blooming. If you go through the SOHO archive, you'll see this happening whenever a bright object is in the image. Venus is the brightest thing you'll see, and it blooms quite a bit. I don't know what was in the SOHO field in the Ra image, but it was bright and it bloomed (it may have been a very energetic CR). Those "wings" are not real. They are simply electrons that overflowed inside the CCD itself. You can see several examples on this page: http://www.iwonderproductions.com/suncru.htm. In fact, the explanation given by Joe Gurman on that page is correct, and the webpage author didn't believe him. The cosmic rays and bright objects give the same shape every time because what's happening is inside the CCD, not on the sky. Also, the "torpedo" in that image is a comet! 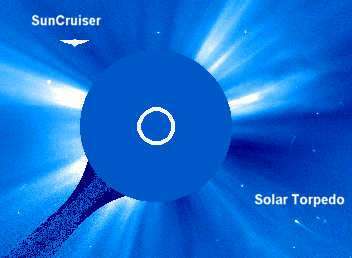 Lots of comets are seen going very near (and sometimes actually impacting) the Sun. 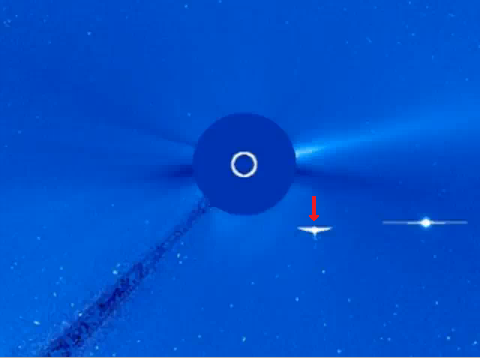 Matter of fact, more comets have been discovered using SOHO than any other single telescope. Hundreds have been seen. As far as other "anomalies" in SOHO images go, there are many, but all the ones I have seen have rational explanations. Sometimes you see what look like palm fronds coming out, fanning across the image (this one is a favorite of The Millennium Group, which you can see here). I asked a SOHO person, and they said that sometimes debris gets knocked off the satellite (there are a few moving parts on the satellite that can jolt it) and this stuff drifts in front of the camera. They are out of focus at first, and as they move away they get more and more in focus. That's why you get the palm frond shape; the thick base is actually when the particle is close, and the narrow tip is when it's far away. It's a time exposure of something coming into focus. Well, that was longer than I anticipated, but I hope it clears some things up. The point here is that people like Tuatha, Ms. Lieder and others have no experience with digital astronomical cameras, and assume they simply take pictures. CCDs are far more complicated than that, and in fact I have just scratched the surface here with what you need to know to interpret CCD images. Every single thing Tuatha has pointed at in the SOHO images actually has a far more mundane explanation than alien spaceships. Like Robert Sepehr (a man who has a Planet X video to sell, and constantly makes easily-disproven claims on a PX discussion group), who constantly claims the Sun is acting up without understanding that this is actually the Sun's normal and expected behavior, Tuatha and the others simply don't understand the subject they are talking about. It's really that simple. I don't mean this to sound condescending; I mean it to be literally true. I try to stay away from topics (like geology and mammoths) in this field when I do not have the expertise to give an informed opinion, but in this case I do. If more people actually went out and tried to find the answers to some of these questions, a lot of the Planet X "evidence" would go away.